Rocky Mountain Signing takes work zone safety very seriously. It is the foundation in which we build from each and every day. That is one reason why Rocky Mountain Signing has an annual traffic control safety kick-off meeting. We hold the traffic control contractors safety meeting each spring and make it mandatory for all field personnel to attend. During our traffic control safety meeting we have multiple stations where we talk about specific work zone safety issues. Station one will review the proper setting of work zone safety signage. Station two will review the proper operation of an attenuator truck. In total we have over eight work zone safety stations for each employee to attend, ensuring in depth training on every aspect of traffic control safety. This is only one of many safety courses Rocky Mountain Signing will have throughout year. All truck mounted attenuator drivers or traffic control contractors must pass a written test and perform a minimum of two ride-a-long’s before they are allowed to operate the truck mounted attenuator on their own. A safe work zone is the key to help assure that all who travel through and work in a Rocky Mountain Signing work zone do so without incident. 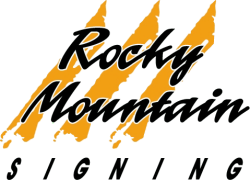 A safe work zone will also play a key part in assuring your project is completed on time and on budget.For the past twenty six years Rocky Mountain Signing has been providing safe work zones and continues to be a leader in traffic control safety. Call us today to get all the traffic control supplies you need!